One of the many highlights of my week was enjoying one of our regular Informal Tea-time Concerts, where we were entertained by nearly twenty children from Years 1 – 6 inclusive. A wide variety of instruments were played, including the ukulele, clarinet, classical and electric guitar, cello, piano and voice. As ever, we are hugely appreciative and in awe of our Director of Music, Karina Warburton’s passion, talent and understanding of the needs of such young performers. Well done to all who took part! 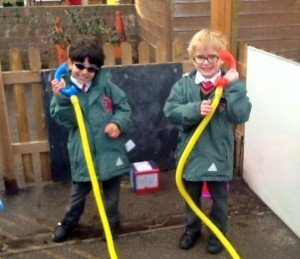 Reception have continued learning about their senses this week and explored their sense of hearing. 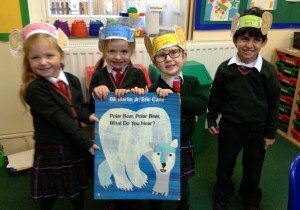 After enjoying the story, ‘Polar Bear, Polar Bear, What Do You Hear?’ the children went on a ‘listening walk’ around school and enjoyed writing about all the sounds and noises they encountered. 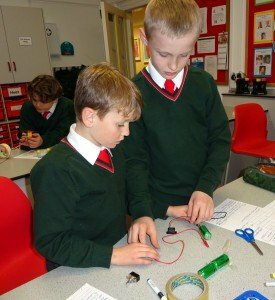 They even made themselves an extra pair of ears to help them! 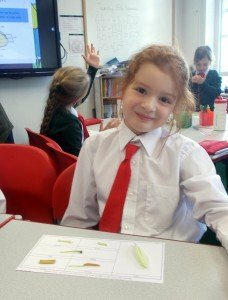 It was a super way to extend the children’s knowledge and vocabulary when learning all about the different parts of the ear. 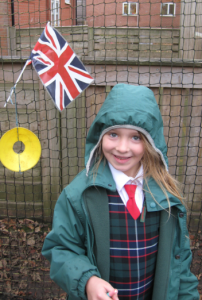 In the forest, the children enjoyed using their outdoor surroundings to make their own musical instruments. 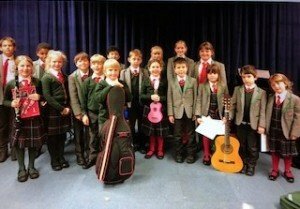 There was a wonderful range of different instruments, including; drums, shakers, claves and even a guitar! If you find that your child has a tendency to lose their gloves, may I recommend mitten clips. 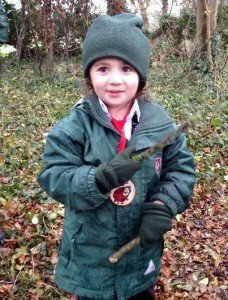 As you can imagine, gloves are easy to lose and little fingers can get cold in the forest very quickly! 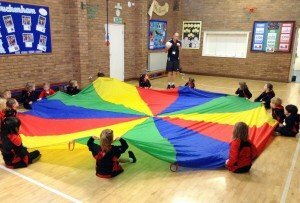 Listening games using the parachute was enjoyed by all in P.E. whilst celebrating Fairstead Fred’s birthday was another big highlight of the week. Please could the children bring in their named Nativity costumes on Monday. Thank you. 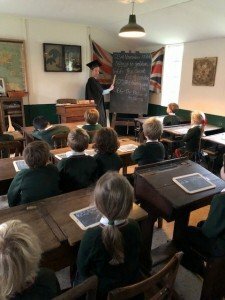 Year 1 spent the most wonderful day at the Anglian Life Museum in Stowmarket, where they attended a Victorian school for the morning. It was a most authentic and great hands-on experiecne for all. 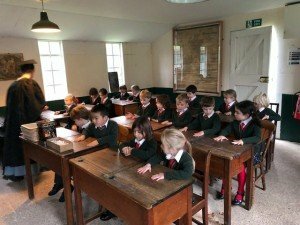 The children paid a penny in order to go to school, sat upright with straight backs and were very quiet all morning. One could have heard a pin drop! 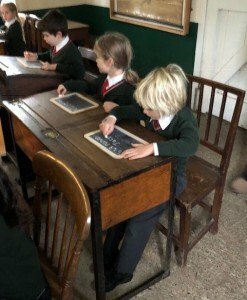 Hand inspections and drill took place and the children really enjoyed writing on slates rather than in their exercise books. 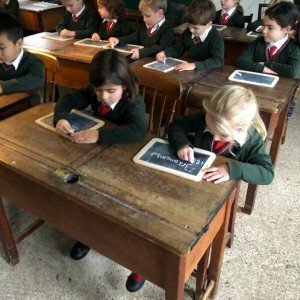 Some children thought it would be a good idea to always write on slates! 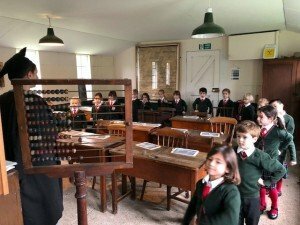 We then explored exhibitions from the 1800s to the present day, looking at diferent interiors and the children had great fun finding out what different things were used for. 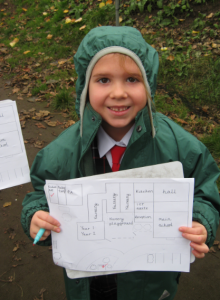 In Geography, Year 2 have continued learning about maps. 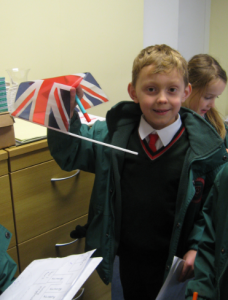 They started the week by using a map of the school to locate seven hidden flags. 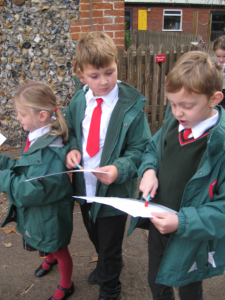 The children used their map reading skills to navigate their way around the school grounds and marked where they found the flags on their maps. After studying several aerial photographs of circuses, the children then designed bird’s eye view plans of their very own circuses! They thought carefully about where the animals would exercise, where the audience would park their cars, where the performers would stay and how these areas would look from a bird’s eye view. 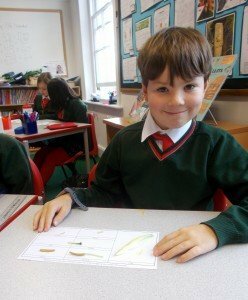 In Science, Year 3 have been studying pollination, fertilisation and germination in flowering plants by dissecting lilies, identifying and labelling their parts, explaining each parts’ function and illustrating the life cycle. This afternoon, Ms Marshall gave Year 4 a fascinating and informative illustrated presentation about the Maya civilisation and Mexico today. 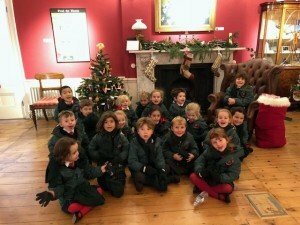 The children loved exploring all the local art and craftwork and finding out about their provenance. 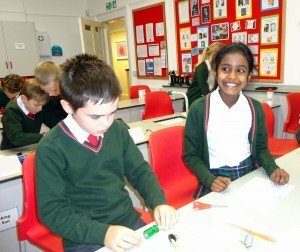 The class were exceptionally engaged and Ms Marshall was very impressed at the subject knowledge and interest in the topic. Many thanks to Ms Marshall for this delightful presentation. This week, Year 5 has continued to enjoy learning about our World War II topic, focussing on the Blitz. 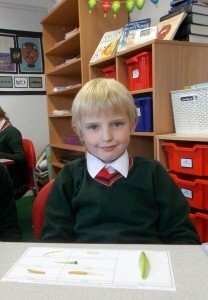 The children have been so enthusiastic and captivated finding out about the events that occurred during this period. The children enjoyed writing some thought provoking poetry of this event using wonderful descriptive language and poetic features. 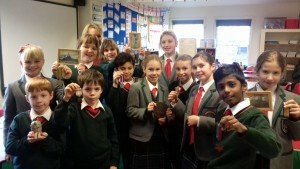 Mrs Blazey, delighted the class when she brought in a variety of WWII memorabilia from the experiences of her own family. A highlight was handling a real hand-grenade (disabled!) and numerous medals awarded to family members for their bravery! We are very much looking forward to our trip to the Imperial War Museum on 4th December this term! 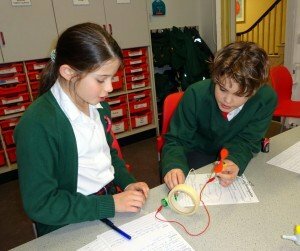 In Science, Year 6 planned an investigation, with a partner, to determine how the voltage in an electrical current affected the different components. They had to determine which were the independent, dependent and controlled variables and plan a fair and comparative test to study their results. 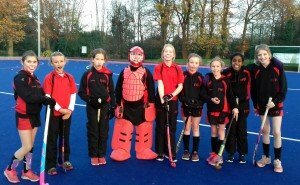 “On Wednesday 21 November, the U11 girls team played a hockey match against St. Joseph’s. This was the first time we had played St. Joseph’s and we enjoyed playing against a new school. We started with the ball and Ella instantly scored. Abisha was excellent in defending the goal and Isabella and Evie went in for strong tackles, clearing the ball up the pitch. Ava and Lara were getting into big spaces and calling for the ball and Eleanor made a few great saves in goal. Cecilia made strong passes down the wings which allowed Ella to score four further goals and Ava and I to both score a goal each. “On Wednesday 21st November, the U11 Boys participated in a rugby triangular with the Abbey School and St Joseph’s School. Our first game was against the Abbey School. We kicked the ball to them and they immediately dropped it. We then gained possession but they soon grabbed the ball from us and managed to get a try. A couple of heads went down and they managed to score four more tries. We scored a try but unfortunately we lost the game, 5-1. We then went on to play our last match against St Joseph’s. It was tight and everyone got stuck in. We had a few successful scrums which allowed us to make a few runs and attempt to win tries but, sadly, the score was 2-1 to our opposition. 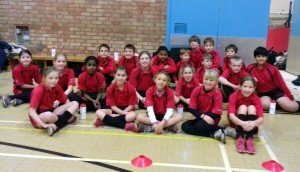 ‘On Thursday 22 November, the U11 Mixed Athletics team went to a Forest Heath schools competition at Newmarket Academy. There were sixteen schools competing, including us and we had a really good time. We took part in running races, relays, and field events including speed bounce, long jump, triple jump, javelin, vertical jump and the chest push. The boys’ team came first in the ‘over and under’ relay and there was some brilliant running from James, Madoc, Toby and Junior. The girls’ team came first in four different relay events. We came second in the over and under and the two lap relay. Our sincere thanks to all of the parents who worked tirelessly to ensure that last weekend’s Autumn Glow was the huge success that it was. 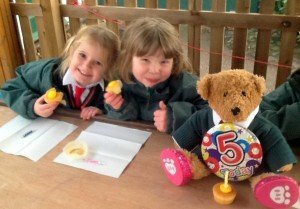 It was evident that everyone had a wonderful time and a significant amount of money (over £1,000) was raised for the Parents’ Association funds. Our particular thanks to Mr Heslop and Mr Thomas and their helpers. The Parents’ Association will be holding a Film Night on Friday 30th November. The popular Christmas film, ‘Elf’ will be shown and tickets are £5, on sale from the School Office. The film will begin at 4.30pm and evening will end by 6.30pm. This event is open to children in Reception to Year 6. Please find a booking form here. 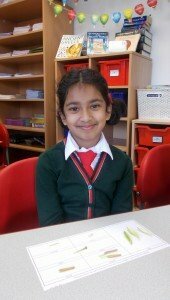 This week, Kindness Cups were won by Yuru in Reception and Evie in Year 5. Well done, children! 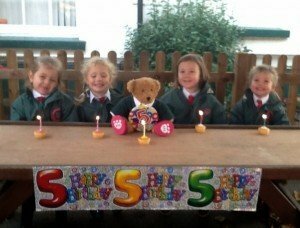 This week, we wish a happy birthday to Yuru and Aria in Reception, Annabelle in Year 1 and Toby and Isabella in Year 3.